It's only been two days since Grand Theft Auto V finally launched on PC, but the community's already come together to (sort of) enable Oculus Rift support for the game. The hack comes courtesy of VorpX, a community-developed tool that also forces VR support in a number of high-profile titles like BioShock: Infinite, Dragon Age: Inquisition, and Battlefield Hardline. Basically, VorpX adds game-specific stereo profiles, allowing for rudimentary first-person support where applicable and (as of recently) a "cinema mode" for third-person games. It's not native support—not even the aborted native support of something like Alien: Isolation—but it's better than nothing, especially as most of these titles are older and never going to receive official VR support anyway. 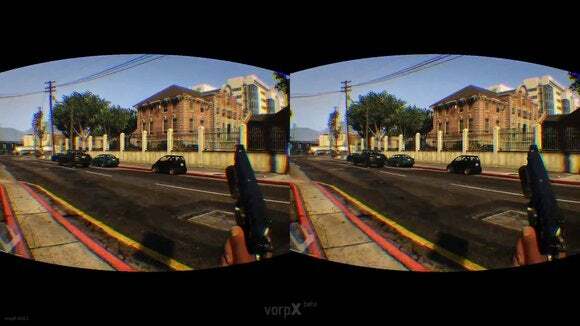 Combine VorpX and Grand Theft Auto V's first-person mode and you get...well, pseudo-VR. That is, the game will allow for head-tracking to simulate mouse movement. That's good enough for some, though—videos have started showing up on YouTube of people playing in VR (as discovered by Simon Carless and then written about by Kotaku). One shows a motorbike ride at night, though without the distinctive side-by-side Oculus view it looks like a normal first-person video. The main issue currently seems to be getting the FOV to play nicely with both on-foot and in-vehicle sections. That second video finds a fix for on-foot sections that then looks pretty ridiculous (stretchy arms plus cramped space) once he gets in a car. The other thing to keep in mind if you're debating throwing down money for VorpX and trying this yourself: You'll need some pretty powerful hardware—likely a pair of high-end graphics cards if you want to crank up the graphics settings. Don't forget that to play in VR you actually have to render the game twice (once for each eye) and try to hit a target of at least 75 frames per second (the base refresh rate of the Oculus Rift DK2). Nevertheless, Grand Theft Auto V modding is off to a good start, even without official support from Rockstar. Just one more reason to always play on PC.